The new model of the Tiger series by Mimaki was the main feature of an open house at the headquarters of Mimaki Bompan Textile in Tradate, in the province of Varese, attended by printing works and Italian and European textile printers, as well as experts in the field and representatives of the trade press. "The fusion of innovation and design is the claim that we have chosen for this solution, which combines the Italian design – stable and robust – of the machines of La Meccanica, with the electronics of Mimaki," explained Bert Benckhuysen, senior product manager at Mimaki. "In fact, externally we have not modified almost anything of the products of the mechanics, including the carpet system guider, but internally we have changed everything, drawing on the know-how of Mimaki." 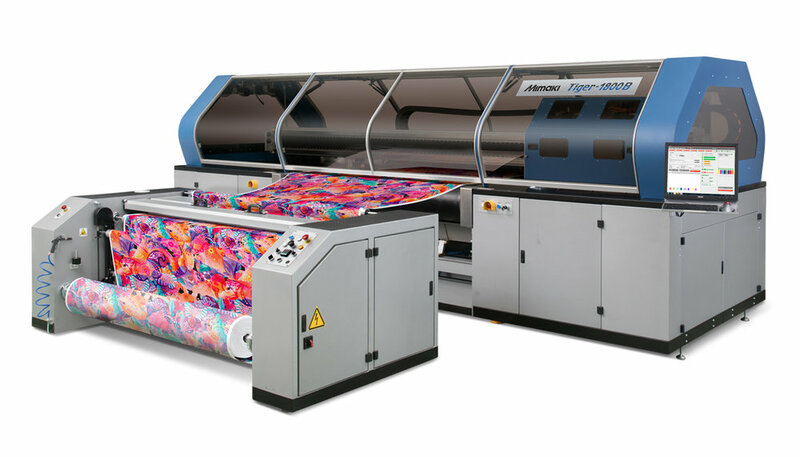 Tiger-1800b MkII is a high-productivity sublimation or direct-to-fabric digital printing system with a range of innovative technologies that improve performance in terms of quality and operational efficiency. It features MAPS (Mimaki Advanced Pass system), an anti-banding system that allows you to efficiently manage – through an algorithm – the arrangement of the ink droplets based on color, density and print speed, and the NRS (Nozzle Recovery system), a Nozzle restoration System – able to replace clogged or damaged nozzles without interrupting production. In addition, the Tiger-1800b MkII features MCT (Mimaki Circulation Technology), a system that ensures continuous recirculation of ink, including the cans and printheads, to avoid settling ink and leaking nozzles. Another novelty concerns the presence of a wiper for each print head, useful for speeding up cleaning operations and reducing maintenance times. Available on the Tiger-1800b MkII is, then, the system for automatic power control, which automates the adjustment operations. The new system uses the proprietary inks of Mimaki, certified by the Eco Passport by Oeko-TEX. "These are the main novelties of the new Tiger-1800b MkII, but the features introduced are many more. We have devoted a lot of time, resources and energy to the development of this high-productivity printing system and we are happy with the result and proud of the quality of the print. " Live demonstrations of the new platform of Mimaki were made in the showroom of the company, which launched another challenge: "We have chosen to adopt a very competitive pricing strategy because we are convinced that the market will soon recognize the Goodness of the product.
" An interesting testimony was that of the Polish company Colourama, specialized in the printing of clothing and accessories, but also of textile for the automotive sector, and equipped with technology of Mimaki. Colourama will be the beta-test site for Mimaki, providing its own production site to show the new Tiger-1800b MkII in operation.